An illustration from volume two of the 1853 Nisbet, Hamilton, Adams & Co. "New Reprint", page 174b. A black and white image, with little shading, depicts Ellen and Anthony Fox exchange a note, while Margery looks on, carrying a large basin in the kitchen. Anthony Fox has taken off his hat, it seems in deference to Ellen. 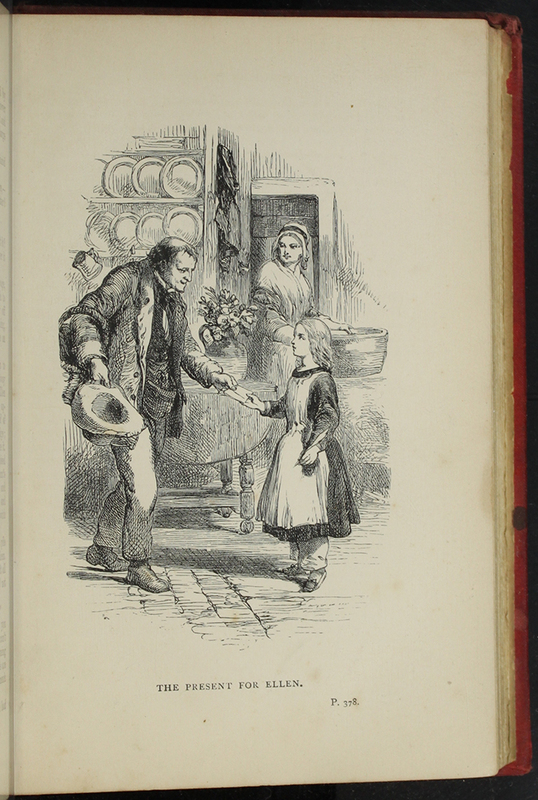 This 4-color wood engraving, appearing on page 378a of the 1886 James Nisbet edition, depicts Thomas handing Ellen a parcel in Aunt Fortune's Kitchen, while Aunt Fortune watches in the background. The illustration first appeared without color in James Nisbet's 1853 Author's Edition (see 3WIS). The parcel being delivered contains a copy of Pilgrim's Progress, which is intended to help spiritually guide Ellen. This black and white illustration is from the 1896 James Nisbet & Co. 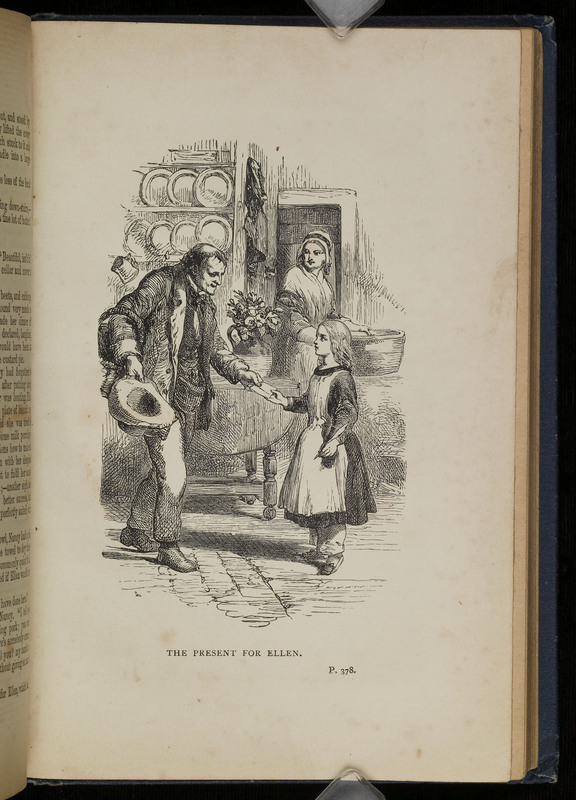 Reprint Depicting Thomas delivering The Pilgrim's Progess to Ellen, while Nancy looks on. The image is sharper and much clearer in print, with darker lines. This may be because it is a newer and better cared for edition. 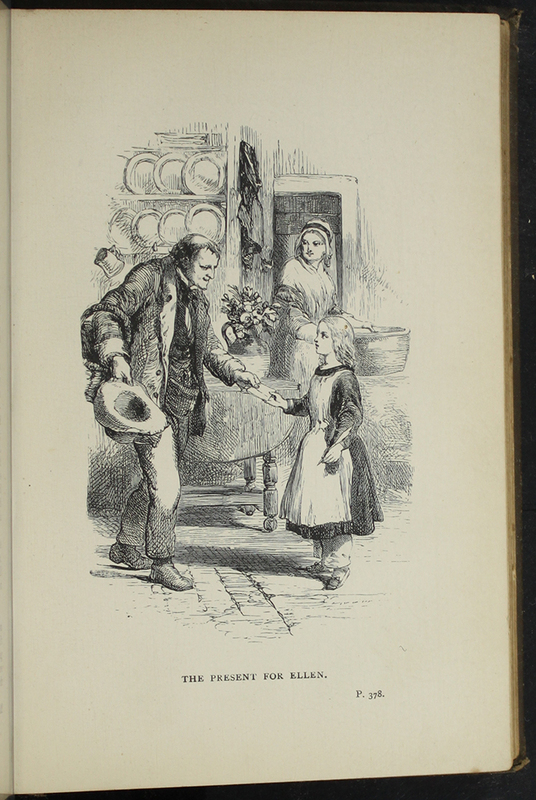 This black and white frontispiece of the 1867 Milner and Sowerby "Wide Wide World Library" Reprint depicts the image of Ellen and Timmins arriving at the Inn, weary from their walk. The Dunscombe's welcome them while also questioning these travelers. This is the illustration on page 86b of the 1853 H.G. 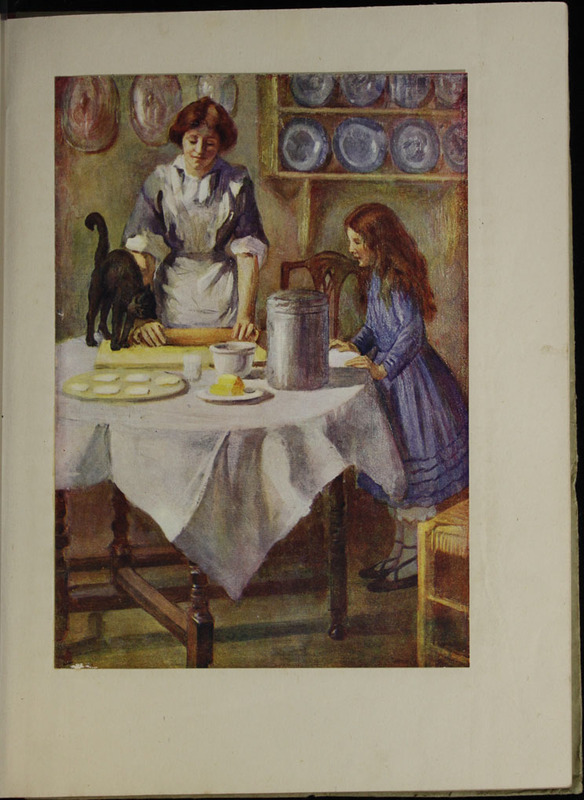 Bohn Reprint, Version 2 Depicting Ellen in the kitchen with Aunt Fortune and Grandma. 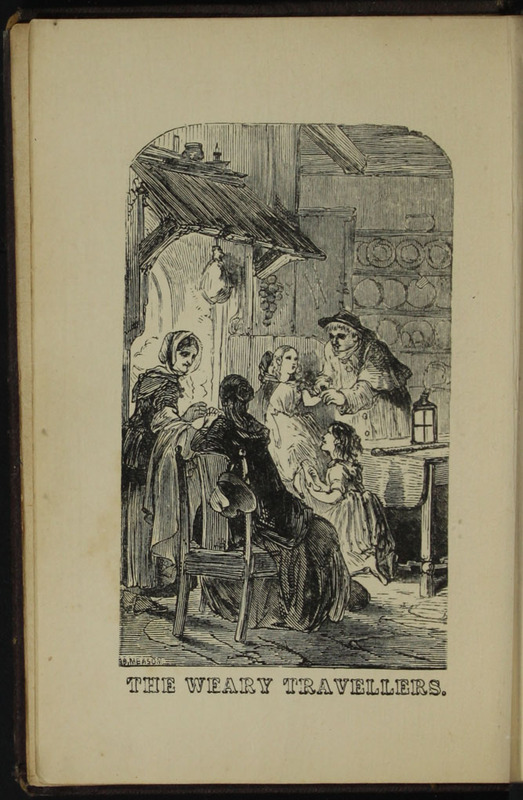 The black and white image depicts a scene where Ellen and her Grandmother are hugging, as Aunt Fortune looks on, setting the table for a meal. The title of the illustration is entitled, "Ellen and her Grandmama". This illustration from the 1891 James Nisbet & Co. Reprint, page 378A, depicts Thomas delivering John's gift of The Pilgrim's Progress to Ellen. Nancy is in the background, doing house work and watching the scene unfold. A table separates them, with flowers on the top. The backwall has a credence with plates resting on it. This illustration, appearing on page 16a of the  S.W. 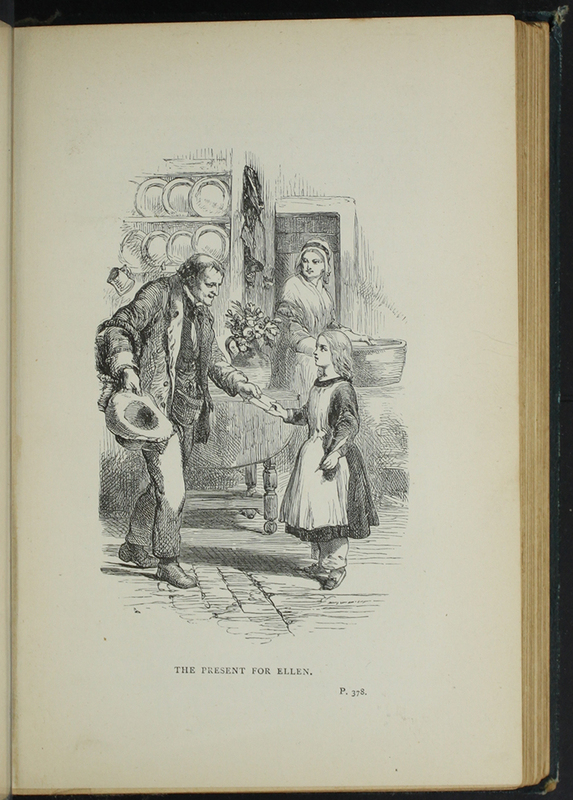 Partridge & Co., Ltd. edition, depicts Ellen's mother selling her ring in order to buy supplies for Ellen's approaching journey to the Hudson River Valley. 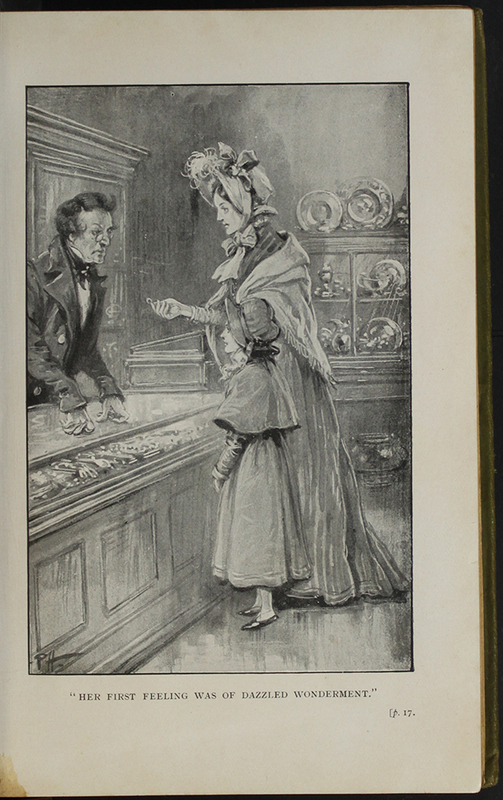 Ellen's mother holds out her ring to a man who looks at the piece of jewelry distastefully as Ellen stands next to her mother watching the exchange. 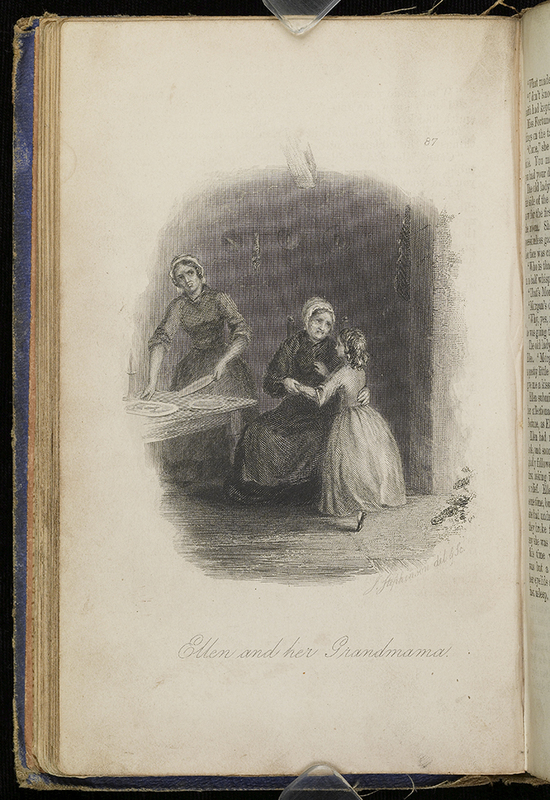 A caption below the illustration quotes a sentence from page 17 of the text and reads, "Her first feeling was of dazzled wonderment," and describes Ellen's emotions upon seeing her mother sell her favorite ring. The store room contains a cabinet full of tableware and a glass countertop covering rows of jewelry. Ellen's mother's dress is somewhat ornate and includes a feathered hat and long shawl. Her face looks haggard, emphasizing her illness, and providing contrast to her genteel attire. This black and white illustration is from the 1891 James Nisbet & Co. "New Edition" Reprint. 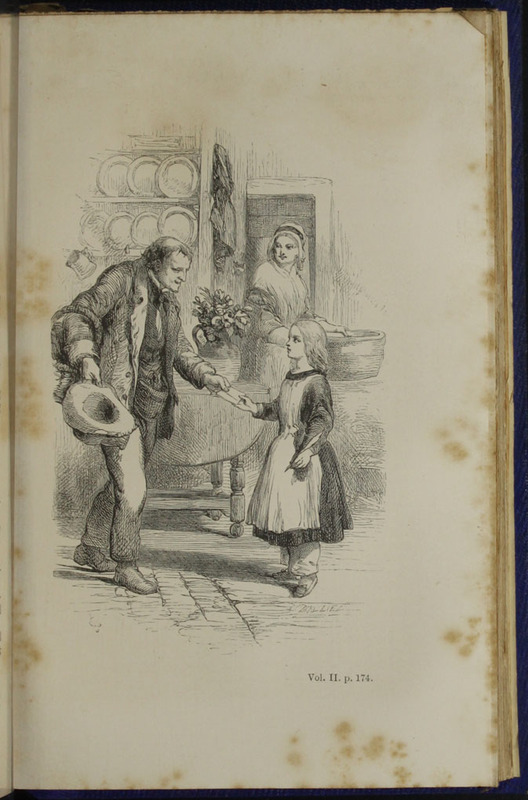 It depicts a scene from page 378 of Thomas handing Ellen a gift from John; The Pilgrim's Progress. This black and white illustration is from the 1893 James Nisbet & Co. Reprint. 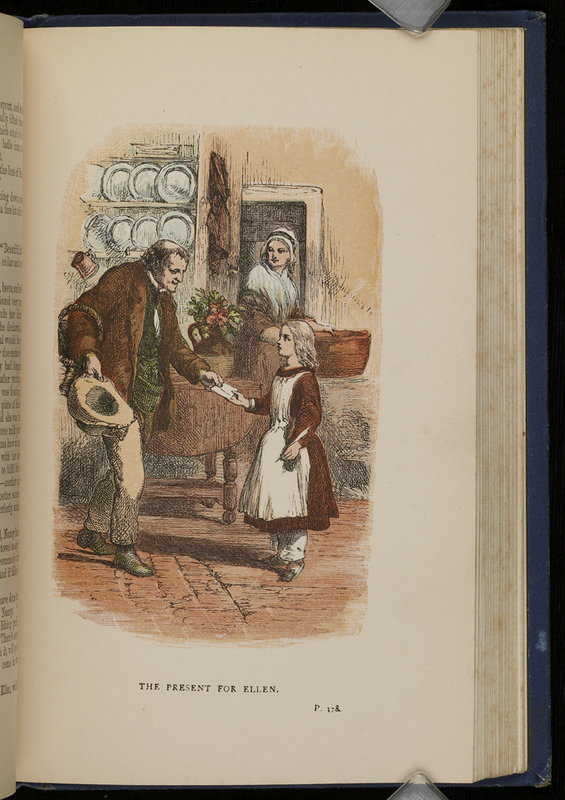 It depicts a scene from page 378, of Thomas delivering John gift of The Pilgrim's Progress to Ellen in the kitchen of Aunt Fortune's as Nancy watches.